Musician/facilitators Benny Harrison and Melissa Guttman work with the residents of Veteran's Haven North on their original song, "Trust." 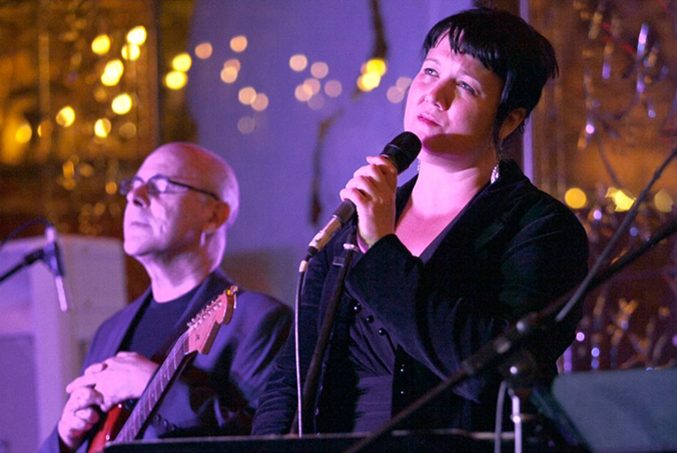 Jennifer Lampert and Julio Fernandez at a MFAS Russian Tea Room gala, performing "Surrender," written by VOV participants at Holliswood Hospital. 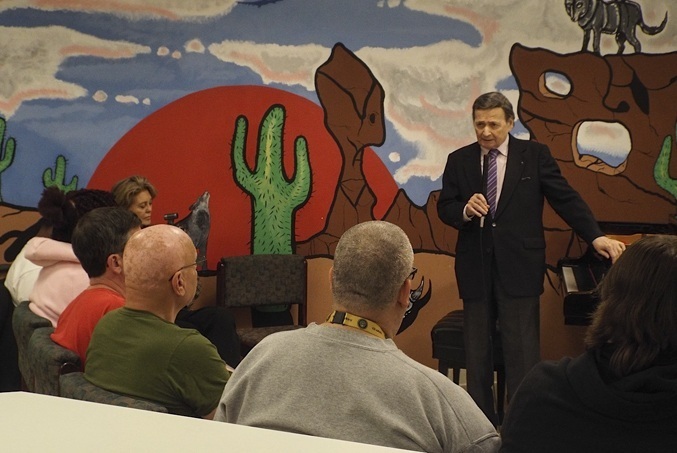 Internationally renowned pianist Byron Janis speaks about overcoming challenges with Voices of Valor participants at Veteran's Haven North. 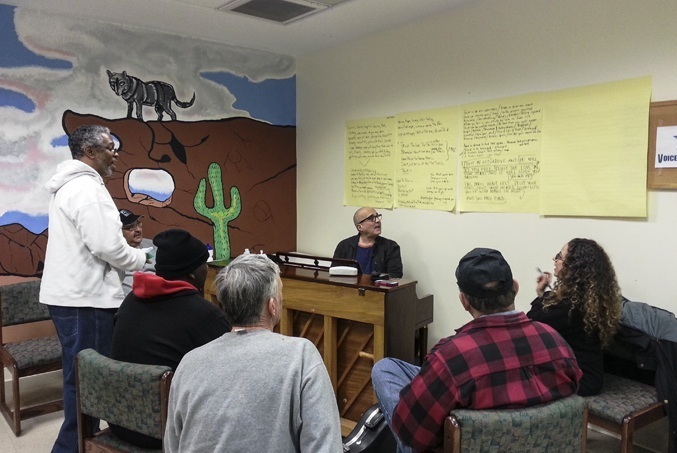 Musician/facilitator Julio Fernandez directs a group of Montclair State University veteran students in a recording session of their song, "Lost in the Words." 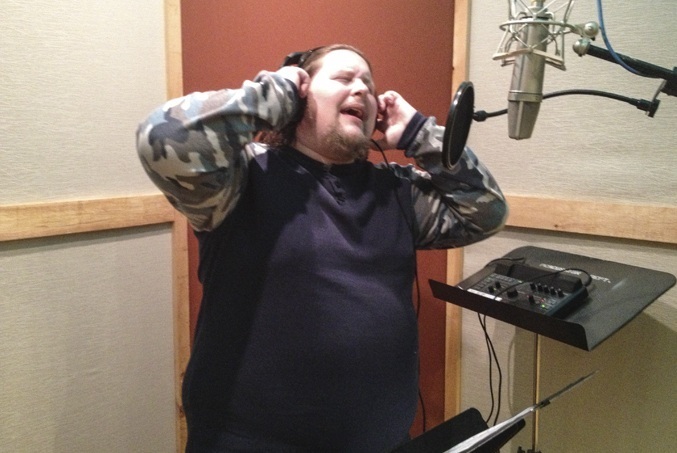 Voices of Valor participant Richard Toth, a patient at Lyons VA Hospital, sings his part in "Standing" at a recording session at Kaleidoscope Sound Studios. 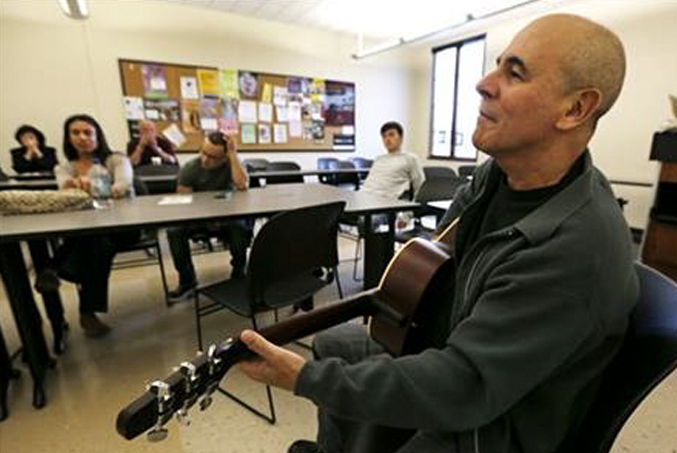 In this Associated Press photo, December, 2012, musician/facilitator Julio Fernandez works with veteran students at Montclair State University on their song, Freedom." Participation in the Voices of Valor program is open to all veterans, free of charge. Eight to ten veterans, with no previous musical experience required, meet with two musician/facilitators and a psychology mentor for eight 90-minute sessions. The sessions meet weekly or more frequently depending upon the needs of the group. The facilitators assist participants in developing a mutual theme and style for their group song. They explore and write their individual experiences, collectively creating a song that reflects their challenges in returning to civilian life. By the eighth session, they all gather in a professional recording studio and record their finished song. The veterans are not required to sing, but almost all choose to do so. The result is a recorded song, premiered at a CD Release Party for participants, their families, and friends. CDs are given to all participants and are available at no cost to all attendees. Photographs of the group and highlights of the sessions are on display and are available for all participants. This program has changed my life. It has given me back the joy and confidence I thought I had lost. The validation and acceptance has made me feel like I’m part of a large family. A unique opportunity for veterans to work with songwriters to create a song based on your experiences and reflecting who you are – no musical experience required! A program designed to honor your experiences and help you use music to ease the transition from military to civilian life. Voices of Valor® is free of charge to all veterans as a result of generous funding from the Robert Wood Johnson Foundation, The Blanche & Irving Laurie Foundation, PNC Bank, and Johnson & Johnson. The highly-acclaimed Voices of Valor program has been featured in nationwide publicity over the past four years. This Associated Press video gives a look at our program in action, showing the leaders, participants and administration of this exciting and creative program that helps veterans reintegrate into civilian life through group songwriting and recording.